“Haldi” ceremony has been a part of Indian Wedding Customs since ever. The glow that comes to the bride’s skin after the ceremony is unparalleled. Haldi or turmeric has skin benefits which are known to all. Right from being natural antiseptic to natural anti bacterial, Turmeric has numerous roles to play. We always think how to get glowing skin at home. The answer is turmeric. Find out how by the end of the article. Your skin is unique and can be prone to multiple or different types of problems. Acne- The word itself leaves you in pain, doesn’t it? Acnes are painful not just for the beauty conscious people but they are REAL PAINFUL!! Their size can be as small as a dot to big as a mammoth (exaggerated, of course!) but both are equally painful. These may be caused due to pollution, adolescence, infection etc. Boils and Blisters- It is a pus filled bump under your skin. It is caused due to infected, inflamed hair follicle. Blisters whereas may or may not be filled by pus. They are just filled with fluids. These not so tiny bumps can be real pain in lives. Rashes- These are red scaly patches on a part of your skin. These cause irritation and burning sensation as well. Something as simple as weather can cause these. Hives– These are itchy welts which occur right after exposure to any allergen. Allergens are allergy causing agents. These can be anything right from pollen grains today to mites. They can be invariably sized. Rosacea- This may be caused due to sunlight, alcohol, spicy food etc. The symptoms are redness of face, raised bumps, rashes etc. These diseases even after getting treated leave a mark, scar or pigmentation on your skin. The pigmentation caused leaves the skin DULL and makes it GLOW-LESS. Whatever the reason be, ultimately it’s you (and your selfies!) that suffer. Because with such dull skinned face, clicking a selfie remains no more a charm. 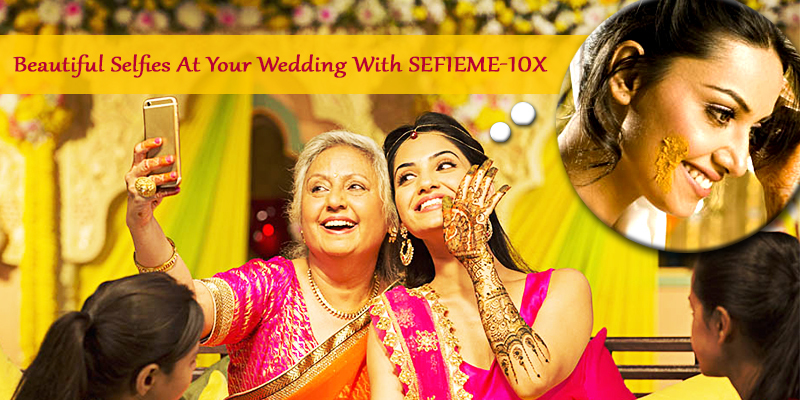 Trusted by our Nani’s and Dadis, Sefieme-10X is enriched with the goodness of curcumin (turmeric). 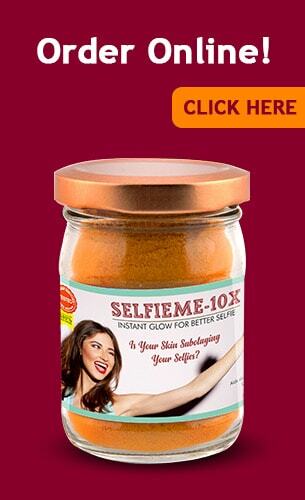 It is your solution for a selfie ready instant glow at anytime. It is one best organic way to bring back the glow, vibrance and freshness to your dull skin. It is Turmeric based. Turmeric has skin benefits like no other. Turmeric is much beneficial for the skin. It holds anti inflammatory properties which targets the pores and calms down the skin. Turmeric possesses natural antioxidant properties. This helps on bringing back the natural glow of skin. Curcumin in turmeric has antifungal and antibacterial properties. These help fight the acne and pimples of your skin. It can heal wounds in your skin left behind due to severe skin diseases. With so many products already flooding the market, you must be wondering why can Sefieme-10X be trusted? Well, we don’t leave you puzzled. Rather here is something to soothe your curious soul. It is free from chemical or chemical based fertilizers. It is non spurious and unadulterated. Sefieme-10X contains the right amount of curcumin to benefit your skin. Collection and processing of Curcumin is also done organically. Possesses natural anti inflammatory and antioxidant properties. It is a GOOD FOR ALL SKIN TYPES Once bought, it can benefit your entire family! How to get glowing skin at home with Sefieme-10X ? Sefieme-10X is enriched with the goodness of curcumin. Curcumin, due to its natural healing properties, heals all the scars and wounds. It is a natural antioxidant which keeps all the free radicals of your skin at bay, giving your skin a healthier glow. Keep in mind these tips for glowing skin and you’ll keep on glowing forever! I was blessed with good skin but over a period of time, it started losing its natural glow and even pimples started popping out! I went to a dermatologist and gave me few ointments and creams but that only added to my woes. I decided to go all natural thereafter and caught hold of Selfieme-10X. Once a week application of this miraculous product can help to get rid of pimples and also gave me the lost glow on ,y face. Love this product!